For geographical coordinates on Wikipedia, see Template:Coord. Longitude lines are perpendicular to and latitude lines are parallel to the Equator. A geographic coordinate system is a coordinate system that enables every location on Earth to be specified by a set of numbers, letters or symbols. [n 1] The coordinates are often chosen such that one of the numbers represents a vertical position and two or three of the numbers represent a horizontal position; alternatively, a geographic position may be expressed in a combined three-dimensional Cartesian vector. A common choice of coordinates is latitude, longitude and elevation. To specify a location on a plane requires a map projection. The invention of a geographic coordinate system is generally credited to Eratosthenes of Cyrene, who composed his now-lost Geography at the Library of Alexandria in the 3rd century BC. A century later, Hipparchus of Nicaea improved on this system by determining latitude from stellar measurements rather than solar altitude and determining longitude by timings of lunar eclipses, rather than dead reckoning. In the 1st or 2nd century, Marinus of Tyre compiled an extensive gazetteer and mathematically-plotted world map using coordinates measured east from a prime meridian at the westernmost known land, designated the Fortunate Isles, off the coast of western Africa around the Canary or Cape Verde Islands, and measured north or south of the island of Rhodes off Asia Minor. Ptolemy credited him with the full adoption of longitude and latitude, rather than measuring latitude in terms of the length of the midsummer day. Ptolemy's 2nd-century Geography used the same prime meridian but measured latitude from the Equator instead. After their work was translated into Arabic in the 9th century, Al-Khwārizmī's Book of the Description of the Earth corrected Marinus' and Ptolemy's errors regarding the length of the Mediterranean Sea,[n 2] causing medieval Arabic cartography to use a prime meridian around 10° east of Ptolemy's line. Mathematical cartography resumed in Europe following Maximus Planudes' recovery of Ptolemy's text a little before 1300; the text was translated into Latin at Florence by Jacobus Angelus around 1407. In 1884, the United States hosted the International Meridian Conference, attended by representatives from twenty-five nations. Twenty-two of them agreed to adopt the longitude of the Royal Observatory in Greenwich, England as the zero-reference line. The Dominican Republic voted against the motion, while France and Brazil abstained. France adopted Greenwich Mean Time in place of local determinations by the Paris Observatory in 1911. In order to be unambiguous about the direction of "vertical" and the "horizontal" surface above which they are measuring, map-makers choose a reference ellipsoid with a given origin and orientation that best fits their need for the area they are mapping. They then choose the most appropriate mapping of the spherical coordinate system onto that ellipsoid, called a terrestrial reference system or geodetic datum. Datums may be global, meaning that they represent the whole Earth, or they may be local, meaning that they represent an ellipsoid best-fit to only a portion of the Earth. Points on the Earth's surface move relative to each other due to continental plate motion, subsidence, and diurnal Earth tidal movement caused by the Moon and the Sun. This daily movement can be as much as a metre. Continental movement can be up to 10 cm a year, or 10 m in a century. A weather system high-pressure area can cause a sinking of 5 mm. Scandinavia is rising by 1 cm a year as a result of the melting of the ice sheets of the last ice age, but neighbouring Scotland is rising by only 0.2 cm. These changes are insignificant if a local datum is used, but are statistically significant if a global datum is used. Examples of global datums include World Geodetic System (WGS 84), the default datum used for the Global Positioning System,[n 3] and the International Terrestrial Reference Frame (ITRF), used for estimating continental drift and crustal deformation. The distance to Earth's center can be used both for very deep positions and for positions in space.
. In the United Kingdom there are three common latitude, longitude, and height systems in use. WGS 84 differs at Greenwich from the one used on published maps OSGB36 by approximately 112 m. The military system ED50, used by NATO, differs from about 120 m to 180 m.
The latitude and longitude on a map made against a local datum may not be the same as one obtained from a GPS receiver. Coordinates from the mapping system can sometimes be roughly changed into another datum using a simple translation. For example, to convert from ETRF89 (GPS) to the Irish Grid add 49 metres to the east, and subtract 23.4 metres from the north. More generally one datum is changed into any other datum using a process called Helmert transformations. This involves converting the spherical coordinates into Cartesian coordinates and applying a seven parameter transformation (translation, three-dimensional rotation), and converting back. In popular GIS software, data projected in latitude/longitude is often represented as a Geographic Coordinate System. For example, data in latitude/longitude if the datum is the North American Datum of 1983 is denoted by 'GCS North American 1983'. The "latitude" (abbreviation: Lat., φ, or phi) of a point on Earth's surface is the angle between the equatorial plane and the straight line that passes through that point and through (or close to) the center of the Earth. [n 4] Lines joining points of the same latitude trace circles on the surface of Earth called parallels, as they are parallel to the Equator and to each other. The North Pole is 90° N; the South Pole is 90° S. The 0° parallel of latitude is designated the Equator, the fundamental plane of all geographic coordinate systems. The Equator divides the globe into Northern and Southern Hemispheres. The "longitude" (abbreviation: Long., λ, or lambda) of a point on Earth's surface is the angle east or west of a reference meridian to another meridian that passes through that point. All meridians are halves of great ellipses (often called great circles), which converge at the North and South Poles. The meridian of the British Royal Observatory in Greenwich, in south-east London, England, is the international prime meridian, although some organizations—such as the French Institut Géographique National—continue to use other meridians for internal purposes. The prime meridian determines the proper Eastern and Western Hemispheres, although maps often divide these hemispheres further west in order to keep the Old World on a single side. The antipodal meridian of Greenwich is both 180°W and 180°E. This is not to be conflated with the International Date Line, which diverges from it in several places for political reasons, including between far eastern Russia and the far western Aleutian Islands. The combination of these two components specifies the position of any location on the surface of Earth, without consideration of altitude or depth. The grid formed by lines of latitude and longitude is known as a "graticule". The origin/zero point of this system is located in the Gulf of Guinea about 625 km (390 mi) south of Tema, Ghana. On the GRS80 or WGS84 spheroid at sea level at the Equator, one latitudinal second measures 30.715 metres, one latitudinal minute is 1843 metres and one latitudinal degree is 110.6 kilometres. The circles of longitude, meridians, meet at the geographical poles, with the west-east width of a second naturally decreasing as latitude increases. On the Equator at sea level, one longitudinal second measures 30.92 metres, a longitudinal minute is 1855 metres and a longitudinal degree is 111.3 kilometres. At 30° a longitudinal second is 26.76 metres, at Greenwich (51°28′38″N) 19.22 metres, and at 60° it is 15.42 metres. is known as the reduced (or parametric) latitude). Aside from rounding, this is the exact distance along a parallel of latitude; getting the distance along the shortest route will be more work, but those two distances are always within 0.6 meter of each other if the two points are one degree of longitude apart. To establish the position of a geographic location on a map, a map projection is used to convert geodetic coordinates to plane coordinates on a map; it projects the datum ellipsoidal coordinates and height onto a flat surface of a map. The datum, along with a map projection applied to a grid of reference locations, establishes a grid system for plotting locations. Common map projections in current use include the Universal Transverse Mercator (UTM), the Military Grid Reference System (MGRS), the United States National Grid (USNG), the Global Area Reference System (GARS) and the World Geographic Reference System (GEOREF). Coordinates on a map are usually in terms northing N and easting E offsets relative to a specified origin. The Universal Transverse Mercator (UTM) and Universal Polar Stereographic (UPS) coordinate systems both use a metric-based cartesian grid laid out on a conformally projected surface to locate positions on the surface of the Earth. The UTM system is not a single map projection but a series of sixty, each covering 6-degree bands of longitude. The UPS system is used for the polar regions, which are not covered by the UTM system. During medieval times, the stereographic coordinate system was used for navigation purposes. The stereographic coordinate system was superseded by the latitude-longitude system. Although no longer used in navigation, the stereographic coordinate system is still used in modern times to describe crystallographic orientations in the fields of crystallography, mineralogy and materials science. Vertical coordinates include height and depth. 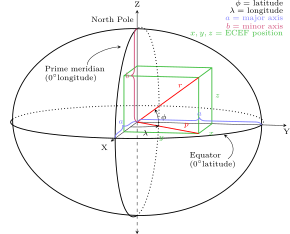 Every point that is expressed in ellipsoidal coordinates can be expressed as an rectilinear x y z (Cartesian) coordinate. Cartesian coordinates simplify many mathematical calculations. The Cartesian systems of different datums are not equivalent. Earth centered, Earth fixed coordinates in relation to latitude and longitude. The earth-centered earth-fixed (also known as the ECEF, ECF, or conventional terrestrial coordinate system) rotates with the Earth and has its origin at the center of the Earth. An example is the NGS data for a brass disk near Donner Summit, in California. Given the dimensions of the ellipsoid, the conversion from lat/lon/height-above-ellipsoid coordinates to X-Y-Z is straightforward—calculate the X-Y-Z for the given lat-lon on the surface of the ellipsoid and add the X-Y-Z vector that is perpendicular to the ellipsoid there and has length equal to the point's height above the ellipsoid. The reverse conversion is harder: given X-Y-Z we can immediately get longitude, but no closed formula for latitude and height exists. See "Geodetic system." Using Bowring's formula in 1976 Survey Review the first iteration gives latitude correct within 10-11 degree as long as the point is within 10000 meters above or 5000 meters below the ellipsoid. Earth centered Earth fixed and East, North, up coordinates. , etc. in this article we will restrict the local coordinate frame to ENU. A similarly well-defined system based on the reference ellipsoid for Mars. ^ In specialized works, "geographic coordinates" are distinguished from other similar coordinate systems, such as geocentric coordinates and geodetic coordinates. See, for example, Sean E. Urban and P. Kenneth Seidelmann, Explanatory Supplement to the Astronomical Almanac, 3rd. ed., (Mill Valley CA: University Science Books, 2013) p. 20–23. ^ The pair had accurate absolute distances within the Mediterranean but underestimated the circumference of the Earth, causing their degree measurements to overstate its length west from Rhodes or Alexandria, respectively. ^ WGS 84 is the default datum used in most GPS equipment, but other datums can be selected. ^ Alternative versions of latitude and longitude include geocentric coordinates, which measure with respect to Earth's center; geodetic coordinates, which model Earth as an ellipsoid; and geographic coordinates, which measure with respect to a plumb line at the location for which coordinates are given. ^ a b Taylor, Chuck. "Locating a Point On the Earth". Retrieved 4 March 2014. ^ McPhail, Cameron (2011), Reconstructing Eratosthenes' Map of the World (PDF), Dunedin: University of Otago, pp. 20–24 . ^ Evans, James (1998), The History and Practice of Ancient Astronomy, Oxford: Oxford University Press, pp. 102–103, ISBN 9780199874453 . ^ Greenwich 2000 Limited (9 June 2011). "The International Meridian Conference". Wwp.millennium-dome.com. Archived from the original on 6 August 2012. Retrieved 31 October 2012. ^ Bolstad, Paul. GIS Fundamentals, 5th Edition (PDF). Atlas books. p. 102. ISBN 978-0-9717647-3-6. ^ "Making maps compatible with GPS". Government of Ireland 1999. Archived from the original on 21 July 2011. Retrieved 15 April 2008. ^ American Society of Civil Engineers (1 January 1994). Glossary of the Mapping Sciences. ASCE Publications. p. 224. ISBN 9780784475706. ^ "Grids and Reference Systems". National Geospatial-Intelligence Agenc. Retrieved 4 March 2014. ^ a b "Geomatics Guidance Note Number 7, part 2 Coordinate Conversions and Transformations including Formulas" (PDF). International Association of Oil and Gas Producers (OGP). pp. 9–10. Archived from the original (PDF) on 6 March 2014. Retrieved 5 March 2014.